The right choice of AFM probes is extremely important for the quality of your AFM work. The BudgetSensors AFM probes are an excellent choice for today’s high demands in nanotech research. 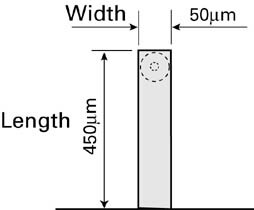 Designed by specialists in AFM, they combine the latest technology of AFM tip/cantilever manufacturing with a realistic pricing. Made of monolithic silicon, they fit into most commercially available AFM’s (See Below for a Complete List) and outperform all other silicon AFM probes on the market when it comes to value, sharpness, symmetry and consistency. The BudgetSensors AFM probes are specifically designed for different AFM modes and are available with a variety of coatings to give the highest resolution needed for cutting edge nanoscale imaging. DLC - Diamond-like-Coating on tip side of cantilever. NEW DLC Diamond-like-Coatings for the Tapping, Force Modulation and Contact Mode AFM probes providing a hard coating on the tip side of the cantilever. The hard DLC coating offers high durability, reduced tip wear and increased tip life. At the same time, the DLC coating is so thin that the tip radius is still less than 15nm. The DLC coating is not electrically conductive. All DLC coated AFM tips have an aluminum reflex coating on the back side of the cantilever and alignment grooves on the holder chip. Order a combination of whatever probes you want. BudgetComboBox gives you a choice of 50 AFM probes from any available BudgetSensors AFM Probe models you need. 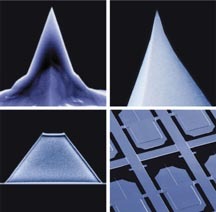 Some AFM systems, such as NanoScale, SIS, and others which use the nanosensors alignment chip as a standard feature, require alignment grooves on the back side of the AFM holder chip for correct holding and calibration of each AFM probe. All products with alignment grooves have "-G" in their product number. Please Note: The presence of the alignment Grooves does not affect the AFM probe in systems that do not require this feature. AFM probes with grooves have the same specifications and pricing as the equivalent probes without alignment grooves. Budget Sensors tipchecker, an SPM sample for fast, convenient and efficient determination of the AFM tip condition. Budget Sensor cost effective AFM calibration standards with 20, 100 and 500nm step height. The AFM Cantilever is micromachined monolithic Silicon, comprising excellent uniformity. It provides high quality imaging for all standard AFM's. 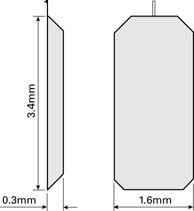 The AFM Tip is a micromachined monolithic Silicon probe, exhibiting excellent uniformity and a sharp tip radius. The consistent tip radius of less than 10nm gives good resolution and reproducibility. 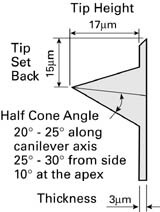 The probes (except the Silicon Nitride tip) feature an "on scan angle" symmetric tip to provide a more symmetric representation of features over 200nm. The BudgetSensors AFM probes are compatible with virtually all AFM systems on the market, please see the list below. Any exceptions are mentioned. If your AFM system is not mentioned in the list, please contact us to ask for compatibility.